Findings suggest that our own immune system may be working against us when it comes to protection from skin cancer. The scientists found that in patients whose tumors expressed B7-H1, an immune-inhibiting molecule in melanoma, suppression of the inflammatory immune response promoted the growth and aggressiveness of their melanoma tumors. A new study by researchers from Yale and Johns Hopkins reveals the molecular pathway by which the body’s inflammatory immune response may trigger its own inhibition, protecting tumor cells from destruction and allowing the growth of melanoma – the deadliest form of skin cancer. The study currently appears in Science Translational Medicine. 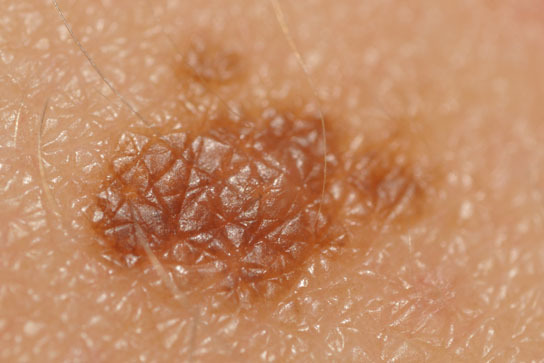 Although it occurs less often than other skin cancers, melanoma causes the majority of skin cancer deaths. It is often curable in its early stages, but once it has spread invasively, it is very difficult to treat. The researchers focused on a specific immune-inhibiting molecule in melanoma tumors known as B7-H1. They found that in patients whose tumors expressed B7-H1, suppression of the inflammatory immune response promoted the growth and aggressiveness of their melanoma tumors. Further, they uncovered the mechanism by which this happens: Tumor cells somehow utilize an active component of the immune response itself, interferon gamma, to turn on B7-H1 and protect themselves by suppressing the immune system. This finding was unexpected, said lead author Lieping Chen, M.D., professor of immunobiology at Yale School of Medicine and director of the cancer immunology program at Yale Cancer Center. “We were surprised to find that aggressive tumors can not only escape or hide from infiltrating immune cells, but can go on the attack — using interferon gamma as a weapon against the immune system,” Chen said. This finding may help explain some disappointing clinical results from cancer vaccine trials, in which the vaccines turned on immune cells but also inadvertently turned on this counter-attack mechanism, Chen added. Chen said that this mechanism may be responsible for immune suppression, and therefore tumor growth, in up to 40 percent of melanoma patients. The researchers suggest that therapies that block this anti-immune pathway may benefit patients. Other authors are Janis M. Taube, Robert A. Anders, Geoffrey D. Young, Haiying Xu, Rajni Sharma, Tracee L. McMiller, Shuming Chen, Alison P. Klein, Drew M. Pardoll, and Suzanne L. Topalian — all of Johns Hopkins Medical Institutions. This study was supported by grants from the National Cancer Institute, Yale Cancer Center, the National Institutes of Health, the Melanoma Research Alliance, the Barney Family Foundation, the Michael Rolfe Foundation for Pancreatic Cancer Research, and the Dermatology Foundation. Be the first to comment on "Immune System May Trigger Melanoma Growth"